"True" multitasking. 3rd party apps simply can't run in the background - the only crack in this policy is that some apps will be able to take advantage of the built-in hub services to run - the touchstone case is Pandora in the Music Hub but Microsoft also mentioned photo sync a few times. Sideloading. 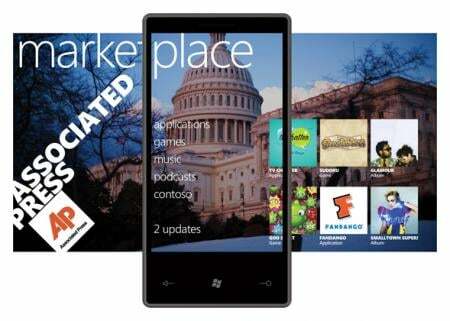 The only way for consumers to get apps on wp7s is to get them through marketplace. The only exceptions: developers, developers releasing beta versions to a limited number of testers, and enterprise apps distributed within a corporation. Microsoft maintains that they're just balancing user demands and there's no doubt that nixing the above simplifies and improves the overall experience for many - if not most - users. To make up for the lack of multitasking, Microsoft is following in Apple's shoes by offering push notification as a substitute for the vast majority of apps. One problem: although they're not interruptive like on the iPhone, they just appear and go away and there's no unified place to view all notifications. To make up for the lack of sideloading, Microsoft has promised radical transparency for the app submission process to their marketplace. Good news: Microsoft has no problem with competing web browsers, email clients, map clients, and the like. They're all welcome. The bummer is that it doesn't appear right now that you'll be able to change your 'default' apps - for example, tapping on an address in email wouldn't be able to be set to open Google Maps. To make up for the lack of removable storage, well, we have the excellent Zune client. However it looks like there won't be a common file area that all apps can access - each app will have access to its own file storage area and be able to use high level APIs to access stuff like music, photos, and the like. So in addition to there not being removable storage, it doesn't look like you'll even be able to access the on-board storage directly as a USB disk. It all goes through the Zune client. That's a lot of doom and gloom above, so we'll back off a bit and say that the apps really do look great and nobody can accuse Microsoft of only going halfway towards their vision of rethinking what a mobile platform and mobile apps should be. Until the phones are out there we won't really know how much the above limitations will chafe.